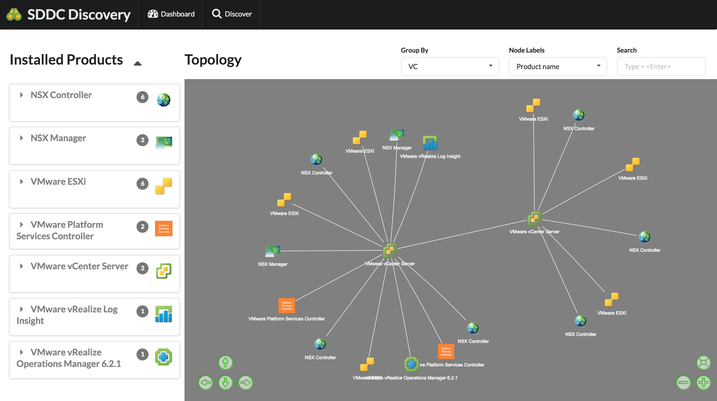 The SDDC Discovery Tool gives users a holistic view of their SDDC deployment. By collecting vCenter server credentials from the user, the tool is able to discover all of the products installed in the deployment by recursive probing. How does it work? It performs multiple levels of probing starting with vCenter server to discover registered products, and then subsequently probes each of those products recursively to gather as much information as possible. Upon successful discovery the results are presented to the user in an appealing and easy to consume list and topological views. Any customer who would like to see the complete picture of all the products installed in their deployment or get specific product information like version, IP address, VM name etc., can use this tool. The tool persists all the discovery results so that the user can see what has changed in their deployment over a period of time. 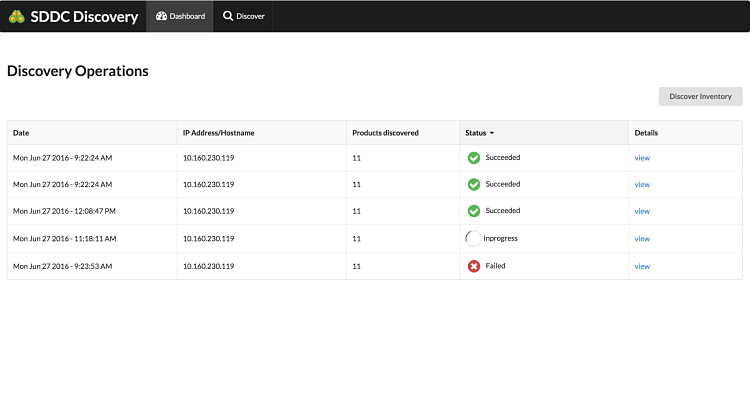 Users can also toggle between ‘VC view' which shows what products are managed by what product and 'Host view', which shows which host each of the products is running on. The PSC’s hosted in the environment are discovered but the vCenter Server and PSC relationship is not computed hence the relationships of VC <-> PSC might not be accurate. The tool doesn't consume vCenter Server Extension APIs hence it doesn't detect any 3rd Party solutions managed by the vCenter Server. Any standard system running Windows, Mac OS or Linux. Any modern web browser (tested with Chrome and Firefox). NOTE: minimum browser window size of 1024 X 768 is recommended. Access to a vCenter server 5.0 or above to initiate discovery. Download the appropriate Windows, Mac OS or Linux sddc_discovery_1.0.zip deliverable. Extract the contents by unzipping the package. At this point the server is started and the application should be accessible on 127.0.0.1:XXXX(typically 1024). The Windows machine should directly launch the application on the browser whereas Mac and Linux users may have to manually navigate to 127.0.0.1:XXXX to launch the application. NOTE: The terminal where the server was started should output the url where the application is accessible. Once EULA is accepted, users will be navigated to the dashboard page. Typically the table is empty as no discoveries have been performed yet. Navigate to the discovery page and trigger discovery by providing VC credentials that need to be probed. Upon successful discovery, the user is navigated to summary page where all the discovery results are presented. All the successful and failed discoveries are persisted and are shown on the dashboard page.